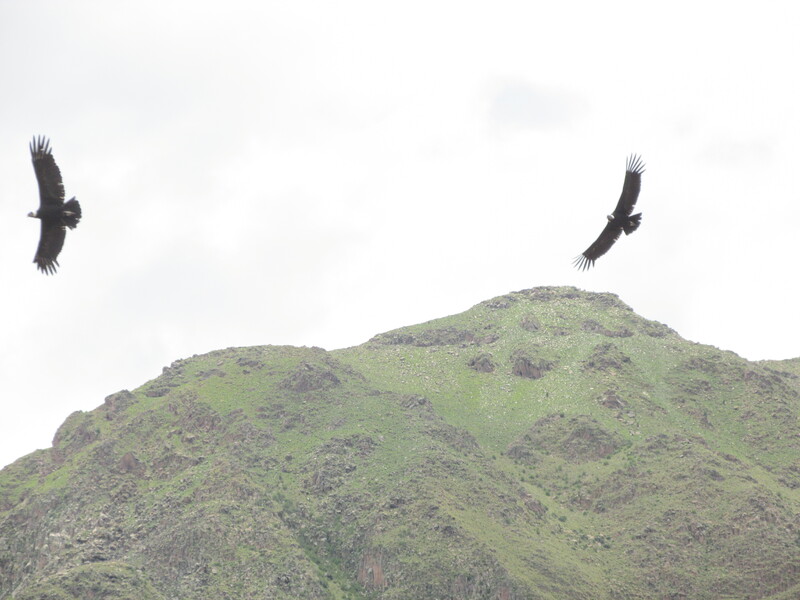 Becoming anti-social in the Colca Canyon | Blog the world!!! Sometimes travelling is about exploring new places, sometimes it’s about trying new things, sometimes it’s about sitting on a bus for days in a row. And others it’s about saying goodbye – for me, the worse part of travelling. Nobody really talks about goodbyes. You’ll hear all about meeting interesting people and all the wonderful stories you’ve shared with other travellers. But rarely will you hear about all the goodbyes. Yes, it’s wonderful meeting people from all over the world, but inevitably the time comes where you need to pack your bags and move in separate directions, almost always never to see each other again. It’s for this reason that I have become incredibly anti-social. In fact I think I may even have become outright rude. I don’t want to talk to people on the bus or in the restaurant. I don’t even want to talk to people on tours anymore. It started a few weeks ago on the Inca Trail – when we started the trek I didn’t want to talk with the group of incredibly interesting and funny people. Of course this attitude didn’t last past lunch and by the end of the few days I was left with the same horrendous task of saying goodbye. But now, a few goodbyes later and I’m less social butterfly (if ever I could be called that with my slight awkwardness) and more odd reclusive – a status that I have taken to quite well with my wildly unkempt hair and eye bags. And, worse of all, I’m about to embark on another social adventure, The Colca Canyon Trek. Tim doesn’t share my anti-social attitude, he really is a social butterfly so trying to keep him from making friends was not going to be easy. You see he’s very English, the kind where he is driven by fear of looking rude. I somewhere along the line lost my Englishness and I relish the chance to be the weirdo in the corner, after all I’m not going to see them again… probably. The day began with a stop for Condor spotting, the lookout was full of tourists so it was easy to avoid talking to anyone. At least to begin with, as we started making our way back to the bus a French boy asked us about altitude sickness and Coca leaves. Whilst the recluse in me wanted to walk off in the other direction, shouting obscenities and wailing, the altitude sickness sufferer in me wanted to offer all the advice I could. Fail number one. We didn’t spot any Condors so the trek began and we quickly fell into a comfortable stroll at the back of the group. It was less strenuous than the Inca Trail and at a lower altitude (just) so it was quite pleasant walking and talking. Then we stopped for a quick snack break, for the most part we were quiet but then a Belgium girl and a Canadian actor began talking about breakfast. This was it for Tim and he quickly joined in, expressing his love of the breakfasts at Home Sweet Home hostel in Cuzco – their next stop. Fail number two. As we began walking I trailed behind, I didn’t like what was happening. The people were nice, I could tell they were friendly, interesting and not in the slightest bit pretentious, but I didn’t want to talk to them. I didn’t want to have to say goodbye anymore. Tim came back for me but the damage was already done, the streams of conversation were open. Fortunately the trek upped its difficulty levels and I was soon distracted from my sense of impending doom. As we negotiated the steep path down, sliding as the gravel under our feet decided it too wanted to get to the bottom, I forgot all about my people issues and focused only on the scenery, staying alive and the two majestic Condors we managed to spot above us. Just as I was starting to tire, I spotted the guesthouse far below in the distance… well actually I spotted its (and the surrounding complex’) glistening swimming pool. And almost immediately it began to rain. No swimming for us then, still rain was the perfect excuse for sitting in my room and being anti-social. Good. When we arrived at the complex we were ushered into a bar, this made me wary but nobody was being too sociable which suited me nicely. Then we were shown our rooms – or allocated space with at least three walls and a bit of a roof – and told to meet again in an hour. We settled into our dark room (no electricity) and chatted, enjoying each other’s continued company and (for me at least) feeling glad we weren’t ‘making friends’. Then it all went wrong. We were a little late getting back to the bar (yess, less socialising time) but when we arrived everyone was sat around the table with hot drinks. ‘Sorry, could you pass the milk?’ I said as I filled my cup with hot chocolate. Fail number three – the gates of conversation were opened once more. We spent a very enjoyable evening learning about Belgium, Germany and what it means to be a Canadian actor. We ate, drank and laughed. It was hateful. It was a tough morning, the walk was three hours up a very steep Canyon. And having only just properly got over my altitude sickness, my limbs were still weak. Combined with my challenging height and dodgy hips, I struggled to haul myself up the cliff. Despite my slowness, everyone was so welcoming at the top that I quickly forgot my disagreeable attitude and chatted all through breakfast (Eggs and rice – it was supposed to be bread but they ran out and gave us a Peruvian breakfast instead, we loved it!) and the following bus ride to the hot springs. Fail number four. The hot springs were made into a series of beautifully landscaped pools and they were so utterly magnificent after the mornings trek. They were busier than the trek had been because the people on a day’s tour also meet there. This led to fail number five as a group of day trippers enquired after the trek. By this point I was giving up on my mission to be the strange girl in the corner. Four fails in a few short hours, I was hardly doing well. So I chatted on the bus, when we all got out at the highest point, when we stopped to take photos of Llamas and even when we popped into a village to witness a Carnival parade and see some big birds. By the end of the trip I’d made friends yet again and it was time to say goodbye again. This time though we didn’t share email addresses. It was refreshing. I had met these people, but they were not friends they were travellers and whilst it had been an amazing trip we left it at just that. It was almost romantic – wandering spirits crossing paths in the night. It felt nice to leave it that way. No need to feel sad about leaving people behind. That said I’ve made some amazing friends on my travels, mainly whilst volunteering but a few others along the way. And there is at least a handful that we already keep in touch with. Unfortunately there’s only so much room in my heart for friends I may never see again and I’ve reached my limits. So for the rest of this trip, and maybe my life, I’ll be the stranger in the corner with a sullen scowl upon my face should anyone try to break my silence… unless of course they need a little altitude sickness advice, then I may even stretch to a smile.